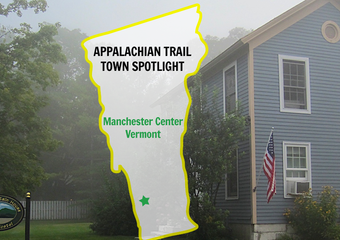 The Trail Town Spotlight series is back, this time coming from Rangeley, Maine! This town sits at NOBO mile 1,967 (SOBO mile 220). Coming from Gorham, NH (mile 1,891), NOBOs may be tempted to do try some big miles and go straight to Stratton, Maine (mile 2,001). Not so fast. Even after getting through the Whites, Southern Maine is some technical hiking, and Mahoosuc Notch makes for a challenging day. A few days later, Stratton still seems far away and the hitch to Rangeley becomes hard to resist. The AT opens up to Rte 4 and an attached parking area, which is a great place for optimistic hikers to find a hitch. If options in the parking lot look sparse, head 0.3 miles west on Rte 4 and try for a hitch by the entrance to Hiker Hut. From there, it’s nine miles west directly into town. Not every hiker goes into Rangeley, since Andover is 35 miles south and Stratton is 34 miles north. Those who do will find a post office, IGA supermarket, $5 shower, Ecopelagicon Nature Store outfitter, plenty of food options, and a taste of Maine’s tourism draw. Some hikers choose to stay a night and others opt for a quick resupply and keep moving. For those hikers ready to give their feet a rest, the first option is The Hiker Hut. No hitch required, it’s just 0.3 miles down ME 4 from mile 1,969. People who have stayed here describe it as “off the grid” and is a quiet little sanctuary along the Sandy River. Cabins and vegetable/flower gardens blend seamlessly into the environment. 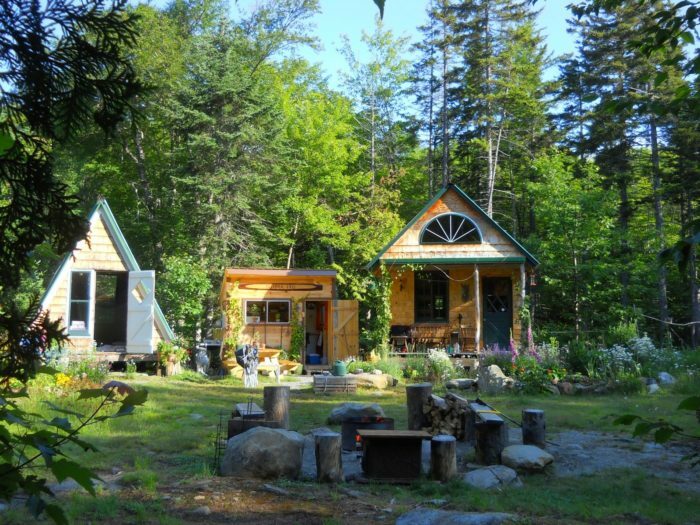 Hiker Hut features home-cooked meals and a “hippie hot shower” at the water’s edge. Hikers may also be interested to know they have an on-site massage therapist and a shuttle into Rangeley. For those who enjoy a little more “on the grid,” check out the Farmhouse Inn. About one mile from downtown, the Farmhouse Inn offers shuttles, laundry, bunks, and individual rooms. Hikers seen around Rangeley in Hawaiian shirts are likely wearing the Farmhouse Inn’s town clothes available to hiker guests. 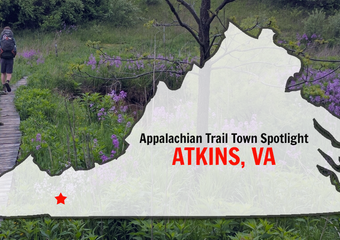 Slack packers and hikers looking to get to towns up and down the trail should check with them. Northbounders finding themselves late in the season may want to consider this opportunity to flip up to Katahdin and flop back to Rangeley to beat the weather. The Farmhouse Inn offers bikes to get into town. IGA Supermarket is about 0.6 miles south on Rte 4 from the heart of downtown Rangeley. 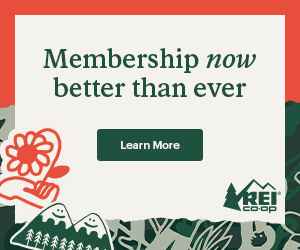 Right downtown is Ecopelagicon Nature Store—an outfitter that carries water filters, backpacks, tents, dry sacks, and more. Ecopelagicon also has a hiker box – very AT hiker friendly. This may be a good option for SOBOs looking to retool their gear, or NOBO hikers who need to replace anything before the final stretch. Situated on a thin land bridge between Rangeley Lake and Haley Pond, downtown Rangeley is buzzing with all sorts of people who enjoy the outdoors in Maine (and not just hiking). I grabbed a pizza and charged my phone at the Red Onion, and people-watched as boaters, hikers, fishers, kayakers, and star gazers all weaved through each other on the sidewalk. Rangeley is full of food options in addition to the Red Onion. Sarge’s Pub and Grill (live music and karaoke), Moose Alley (bowling and billiards), and The Shed BBQ are a couple of places to grab something to eat and enjoy Maine, among other places on Main Street. 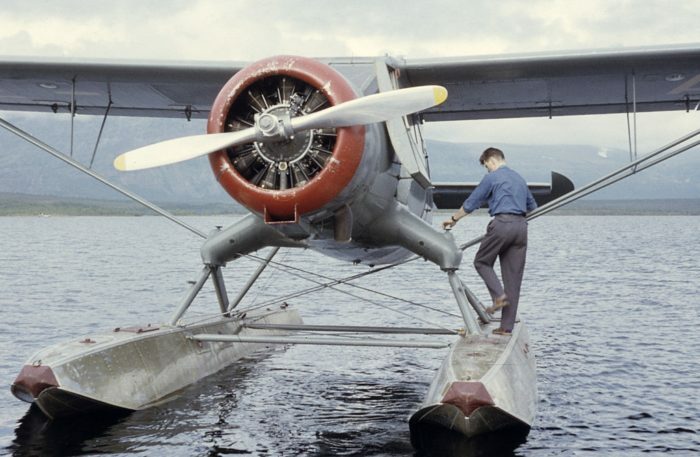 If you’ve never seen a sea plane land or take off from the water, this may finally be your opportunity at Town Cove Park. It was my first time. Hikers can get a shower for $5 at the Rangeley Health and Wellness Center (around the corner, walking distance from IGA). In downtown, hikers can easily walk to get ice cream at Moosely Bagel’s & Ice Cream, coffee and treats at Inner Eye coffee shop, and stop in at the Rangeley public library. The people, businesses, and town of Rangeley have made a great effort to create a supportive atmosphere for hikers and it shows. Northbounders have been trying to get to Maine for months by the time they reach Rangeley. Do yourself a favor and experience this Maine town. My name is James - I grew up in Wisconsin, and now I live in Denver, CO working as an engineer. 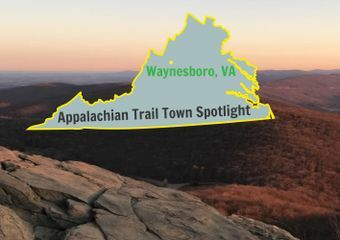 In 2015, I thru-hiked the Appalachian Trail as Autodraft. Might be my favorite Trail Town, right next to favorite Mountain. Of course I might be biased as I was based in Rangeley 1 summer as an MATC caretaker. The Hiker Hut was one of my favorite zero on the whole trail, there is something special about not having wifi and not having to walk you just enjoy your day in such a slow and lazy way. It helped that I had some great co-bunkers with me (did’nt know them beforehand)! And the outdoor shower is the best one I’ve seen on the whole trail.